Easily convert any Model 43 to accurately read Peak as well as CW power. Uses standard Bird elements with space to store 1 additional within the meter housing after conversion. Push-on/push-off switch for easy switching between CW and peak power. LED to indicate the meter is switched to Peak mode. No wiring required, mounts on meter studs on most Bird 43 wattmeters. The Model 4300-400 kit is designed to easily convert any Model 43 to accurately read peak power in AM, SSB and certain limited pulse applications. Installation of the kit in no way affects the Model 43's ability to accurately read CW power. 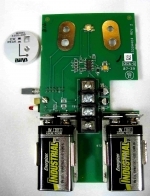 The circuitry operates from 2 standard 9V alkaline batteries. Good condition Bird Leather Carry case holds and protects your Model 43 style meters along with space for 6 elements in the flip up lid. A bit more expensive than the new plastic carry cases, this is the Classic Bird Electronic carry case. Used, in good condition. Case is intact and fully functional but will have blemishes and scratches in the finish, usual signs of wear. Protect your Bird wattmeter's sensitive 30 microamp meter movement by using this shorting blank when the meter is not in use. It will dampen the meter movement to protect it from impact and vibration that could damage or destroy the meter movement during shipping and handling. When the meter is not in use there should always be a blanking plug in the element socket. Precision machined from aluminum. 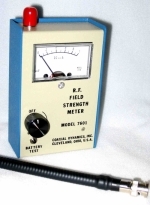 Sensitive, portable RF Relative Field Strength Meter. Locate hidden RF sources, antenna tuning and testing, locate RFI leaks, EMI/RFI testing, RDF Radio Direction Finding. Font panel meter sensitivity adjustment. Input BNC connector, flex antenna included. Internal 9V battery (included). Uncalibrated, non-tuned, broadband 1-3000 MHz. Rugged, scratch resistant aluminum case (same as used in the RF Wattmeters 81000A), made to Coaxial Dynamics high quality standards, 2 year warranty (battery excluded). Bird Type N Male QC connector, used in new condition. BNC female QC connector, new Coaxial Dynamics, or used Bird. Bird QC connector HN male. Bird QC connector HN female. Bird QC connector BNC Male 4 Week Delivery on this item. Bird 7/16" DIN (F) QC connector. 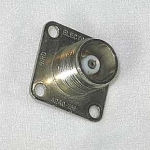 Bird 4240-031 QC Connector for Wattmeter LC(F) New. 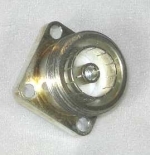 CDI 88010 (same as Bird 4240-002 QC (Quick Change)) Type 7/8 Swivel Flange EIA Connector. Delivery is 3-4 weeks on this product. Line section for Bird 43 watt meters. QC Connectors are not included. Order QC connectors separately. Can be used to make remote or panel meter installations or replacement for Bird Model 43 line sections. Uses the standard Bird Model 43 type wattmeter elements. Used in excellent condition. Replacement meter For Bird Model 43 series wattmeters, 30 ua. 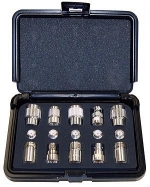 The adapter kit let you assemble compact, precision 50 Ohm adapters to meet up to 45 different matching requirements. 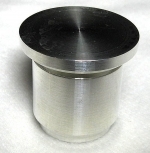 The adapters offer low VSWR because of precision matching and tight mating tolerances. The N (F)/N combination, for example, is below 1.05 to 1 GHz and below 1.1 to 2.5 GHz. Model 4240-401 can fashion 45 combinations and includes enough couplers to assemble 5 complete adapters at the same time. The kit includes N, BNC, TNC, SMA and UHF connectors. UHF Jumper RG8X Cable 24"
RG-8X Rugged 50 Ohm Coax, coonector boot for strain relief. BNC Jumper RG8X Cable 24"
RG-8X Rugged 50 Ohm Coax, connector boot for strain relief. Type N Jumper Cable RG8X 24"
The adapter kit lets you assemble compact, precision 50 Ohm adapters to meet up to 45 different matching requirements. The adapters offer low VSWR because of precision matching and tight mating tolerances. The N (F)/N combination, for example, is below 1.05 to 1 GHz and below 1.1 to 2.5 GHz. Model 4240-400 lets you create 30 combinations and includes enough couplers to assemble 5 complete adapters at the same time. 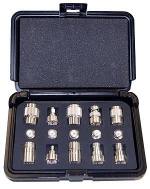 The kit includes N, UHF, BNC and TNC connectors. See Kit Configurations. Replacement meter For Bird Model 4304A series Broadband Wattmeters. Hard shell protective carry case for Bird Wattmeter Elements (12). Rugged but not so large that you need a two wheeler to carry it. Slim design will easily fit tool boxes, suitcases, etc. Foam lined, aluminum frame, metal hinges & latch, hard shell, rugged. The elements in the picture are not included. Transport and safely store up to 12 of those very expensive and somewhat delicate Bird wattmeter elements. Outer dimensions approximately 11"x5"x3", 14 oz. Hard shell plastic with aluminum frame and steel hinges. Rigid foam element cutouts (12) with convoluted soft foam on top to protect the elements from drops, bumps and scratches. This deluxe Pelican 1400 Case has ample room for the Bird 100W RF Load, 5 elements, and a Bird RF Sampler. There's even a hidden comparment for adapters. The meter is completly surronded by foam for ultimate protection for the Bird 43 style meters. 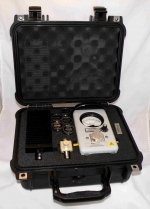 Keep your wattmeter and elements safe and protected in this rugged weatherproof Pelican case. 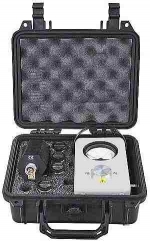 Similar to the Bird Pelican 1200 case but with lot's more room and improved protection for the meter. Foam insert has cutouts for Bird Model 43 or similar Bird wattmeters, Bird 100 Watt RF Load, 5 elements, RF Sampler, and RF adapters. This case is a perfect match for Bird Wattmeters Models 43, 43P, 4314B/C, 4410A, 4304A and other Bird meters of the same design. The ultimate protection for your expensive and somewhat delicate wattmeters. The custom foam cutout completly isolates the wattmeter from any contact with the rugged, hard shell, water resistant case. Martin RF Supply 100% Satisfaction Guarantee. This circuit design has a precision chop stabilized front end amp followed by separate peak detection and hold circuit, so eliminating dc and temperature drift errors. This circuit also accurately matches the expected meter impedance so maintaining its accuracy over the full range of Bird elements. The board and build quality are to a very high standard, and will deliver accurate readings and trouble free service. Push switch to select between peak/SSB and normal mode (power is only required for peak/SSB mode). Dual power source, 4 x AA on-board batteries or an optional external 9 - 24v dc supply. Supports both alkaline & rechargeable batteries - with on-board charging for NiCad / MiMh batteries. Ultra low power circuit design, typical alkaline battery life in excess of 400 hrs. Chop stabilized first stage - no DC drift or temperature errors. User calibration adjustment using any CW carrier. User adjustable peak hold time. Accurate over the full range of Bird elements. Dual mode LED - flashes 1x per sec in PEAK mode - flashes 4x per sec if battery/PSU volts are low. High quality double sided plated through circuit board. Fits all Bird 43 meters with the standard 38mm and earlier 35mm meter terminal spacing. This board fits to the back of the Bird 43 meter movement, no alteration is required to the Bird 43, and the board can easily be removed and the meter returned to its original condition. Powered by 4 on-board AA size batteries, or an external DC power supply (9v to 24v). This is the latest board design compatible with early Bird 43s and includes user adjustable peak hold time, and on-board battery charging. The power jack is on one side of the board, and the push switch, led, and calibration adjustment on the other. These are accessed via the element holder openings - so you can no longer store elements here. This sale is for the peak/SSB power board, supplied with a 2.1mm power jack connector, no batteries or power supply are included in the offer. The batteries shown are for illustration - they are not included in the sale. Two year replacement limited warranty! The RPK8000-1 Replacement Part Kit may be used on all attenuators, terminations and loads using DC 200 Coolant (P/N 5-1070). The kit consist of (1) Shipping/Vent Plug Assembley. 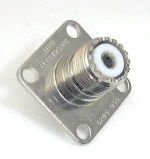 For Bird Termaline RF Loads and Tenuline RF Attenuators.